I was craving something sweet, crunchy and carrot cake like for lunch, but couldn’t exactly have only carrot cake. That would hardly be satisfying. So I thought, Quinoa is a pretty good medium for all sorts of favors. Plus it has that nutty, crunchy taste and texture. 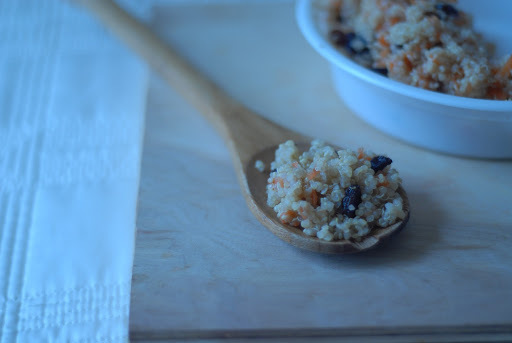 So I whipped up some Quinoa and added some shredded carrots, raisins and the tiniest bit of honey and voila! A healthy, crunchy, tasty and satisfying answer to my carrot cake craving. A big bonus was that my 1 year old loved it too! Bring Quinoa and water to a boil in a small pot. Reduce heat and let simmer for 20 minutes. Remove from heat and stir in shredded carrots, raisins and honey. 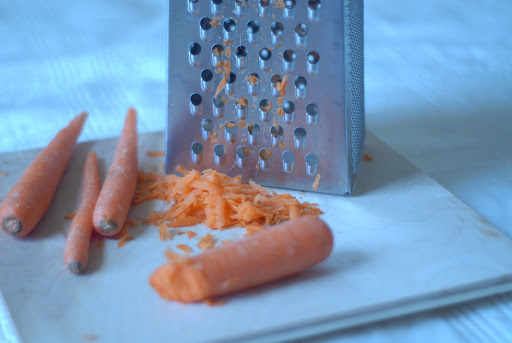 You could buy pre-shredded carrots, but it really takes no time at all to shred your own! Cover for 5 minutes and serve. This is really good hot, but for me it’s even better cold the next day!